Set of 3 ebooks covering two letter initial sound blends in words. The work in these ebooks will progress students from the CVC stage (see our CVC ebooks 1 - 6) to developing their understanding of how more complex words can be tackled. Particularly useful for students who need very careful and systematic learning stages. Graded pages for students of all abilities. Even very difficult student cases will develop substantial skills using this program. Page formatting allows easy enlargement. Clear, sensible illustrations which are welcoming to children. 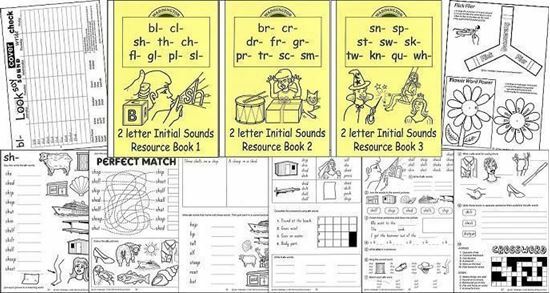 2 Letter Initial Sounds Resource eBook 1 covers bl-, cl- sh-, th-, ch-, fl-, gl-, pl- and sl-. 2 Letter Initial Sounds Resource eBook 2 covers br-, cr- dr-, fr-, gr-, pr-, tr-, sc- and sm-. 2 Letter Initial Sounds Resource eBook 3 covers sn-, sp- st-, sw-, sk-, tw-, kn-, qu- and wh-. - 2 A4 extension sheets which contain harder instructions and more challenging activities. Everything is arranged in such a logical and direct fashion, that all students will be busy regardless of their functional ability for this stage of development. Packed with technology making, puzzles, matching tasks, crosswords, mazes, wonderwords, quiz masters and even some easy cooking recipes. These eBook PDF documents can be used on any computer and instructions are given on disk for easy installation on iPad devices. USB 2.0 physical backup device - 4GB. 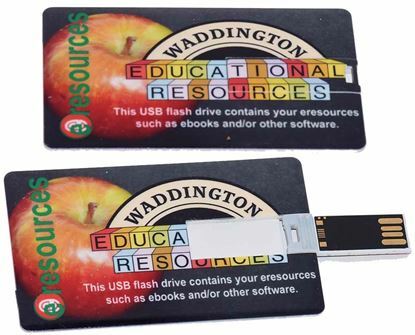 Supplied with your software purchases pre-loaded and ready to connect to your computing device via a USB port. Must be physically delivered with separate postage/handling charge at checkout.